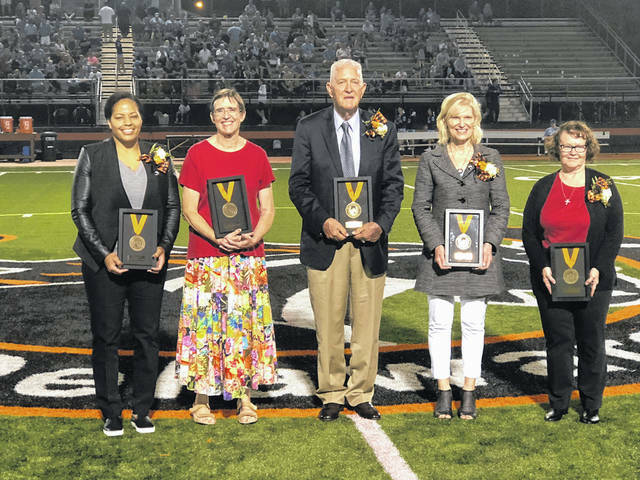 During halftime of Friday’s Delaware Hayes High School football game, the newest members of the Delaware City Schools Distinguished Alumni Hall of Fame were introduced. Pictured, left to right, are the new inductees: Carrie Banks (1996), April Nelson (1974), Richard Andrus Hagar (Willis, 1954), Jeannee Parker Martin (1973) and René Landon Weber (1974). Douglas Baxter (1968) is not pictured. 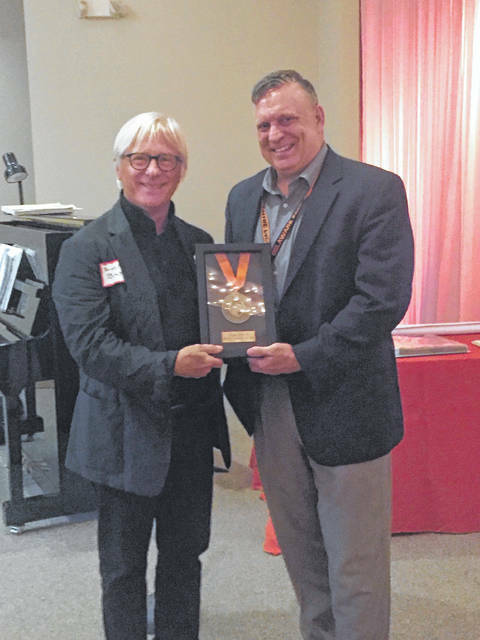 Douglas Baxter (class of 1968) is presented his award by Delaware City Schools Superintendent Paul Craft at a private ceremony when he was in Delaware for his 50th class reunion in August. Baxter could not attend the induction event Friday evening. Delaware City Schools inducted six individuals into its Distinguished Alumni Hall of Fame on Friday evening. The inducted individuals were Carrie Banks (class of 1996), Douglas Baxter (class of 1968), Richard Hagar (class of 1954), Jeannee Parker Martin (class of 1973), April Nelson (class of 1974) and René Landon Weber (class of 1974). Banks, a multi-sport athlete at Hayes, is widely regarded to be one of the best female athletes to graduate from Hayes after captaining the girls basketball team and averaging more than 25 points per game during her senior year. Banks was a four-year state qualifier in track and field in the long jump, the 400M, and as a member of relay teams. She placed sixth in the long jump at the OHSAA State Track & Field meet as a sophomore and had a sixth-place state finish as a member of the 4X400 relay during her junior year. She helped lead the 1995-96 volleyball team to a 17-6 record and a state ranking of 18th in the state coach’s poll. Banks earned All-OCC honors in volleyball from 1993-1996. After graduation, Banks earned a bachelor’s degree in communications from the University of Detroit Mercy and now works as an assistant coach and recruiting coordinator for the Ohio State University women’s basketball team. Baxter graduated from Hayes in 1968 and from Oberlin College in 1972. In 1973, Baxter began working in art galleries in New York City. Baxter is now the president of Pace Gallery in NYC and has organized numerous significant exhibitions and worked with artists and artists’ estates, including Adolph Gottlieb, David Hockney, Sol LeWitt, Maya Lin, Roberto Matta, Robert Mangold, Kenneth Noland, Richard Pousette-Dart, Joel Shapiro,Keith Sonnier, Antoni Tapies and Fred Wilson. Additionally, Baxter was a trustee of Independent Curators International and the Trisha Brown Dance Company, and a member of the Art Advisory Panel of the IRS as well as numerous other foundations, academies and committees nationwide. Baxter could not be present at the awards ceremony Friday, but he received his award during his 50-year class reunion in August. Hagar graduated from Hayes in 1954 and served in the United States Navy from 1955 to 1959 before earning his Associate of Science degree in electronics engineering from Franklin University in 1961. Hagar began a career in aerospace after graduating from Franklin University, and he was eventually transferred to the Kennedy Space Center where he worked as a senior space vehicle test mechanic who tested and repaired electrical systems for the Apollo spacecraft. Hagar served on the investigation team after the Apollo 1 fire and was part of the crew that successful landed a man on the Moon. He also worked on the logistics team that assisted the astronauts on the Apollo 13 mission when their equipment failed. In 1976, Hagar moved on to the nuclear power construction business and held positions including quality assurance manager and employee concerns investigator. Since 2014, Hagar has shared his experiences with schools, STEM programs, universities and civic organizations. Martin graduated from Hayes in 1973 and went on receive a Bachelor of Science degree from Georgetown University and a master’s degree in public health from the Yale University School of Medicine. Martin has been active in health services planning, development and delivery of care for 30 years, and she has assisted organizations around the world. Martin has worked with the World Health Organization and the U.S. Department of State. She is currently the president and CEO of LeadingAge California, vice chairman and principal of The Corridor Group Holdings, and a leader in the strategic development of innovative health care programs. Martin is also internationally recognized as an early pioneer in AIDS care and service delivery. She has advised numerous U.S.-based health companies and organizations, and she is also an associate clinical professor in the Department of Community Health Systems at the UCSF School of Nursing. Nelson graduated from Hayes in 1974 and earned her Bachelor of Arts in history from Lewis and Clark College before earning her Juris Doctor degree from the Lewis and Clark Northwestern School of Law. Nelson had a successful law career and worked with several legal education organizations before transferring to a private practice and eventually becoming a partner at a local firm. Nelson retired in 2004 and went on to develop several special projects, including the Delaware Municipal Court’s mental health docket. Nelson currently serves Delaware County as a staff mediator for the Delaware County Juvenile and Probate Courts and works with families to develop plans to improve school attendance for students. She is the recipient of numerous community awards, including the Delaware Area Chamber of Commerce Citizen of the Year Award, United Way Nancy Frankenberg Award for Community Volunteerism, and the United Way of Delaware County Lifetime Achievement Award, now named for her. Weber also graduated from Hayes in 1974. She worked for the State of Ohio for 33 years before retiring in 2013. Weber attained the position of chief fiscal officer for the Department of Natural Resources and served on task forces for several governors. She worked on a variety of special projects for the state’s fiscal and human resource system. Weber has also been volunteering with the Delaware athletic department for more than 15 years, and she has also coordinated concessions for wrestling tournaments and other sports, volunteered for BINGO, organized team meals, prepared sports programs, and coordinated numerous fundraisers. Weber has been the concessions manager for the past 11 years and served in leadership roles for Touchdown Club and Athletic Boosters. She received the Wrestling Mom award in 2012 and was the first recipient of the Touchdown Club Volunteer award, which is named for her. More information about the Delaware City Schools Distinguished Alumni Hall of Fame can be found at https://www.dcs.k12.oh.us/Page/54.